Today I present to you another gem of an interview. 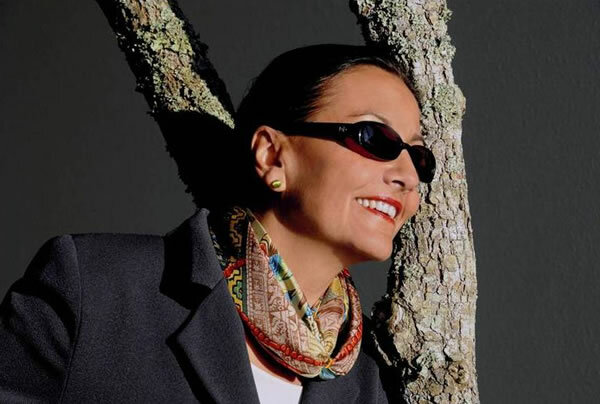 This time with Anne Touraine, aka “The Scarf Lady”. I don’t know anyone who is as knowledgable about scarves as she is, so who better to give us all a style lesson on how to wear scarves? Again, my interviewee shares a wealth of information about the topic and style in general. I know my interviews are lengthy but there is just too much to be gained from the answers. Enjoy! Hi Anne. Thanks for taking the time out to answer a few questions for 40PlusStyle.com. Can you tell us a liitle bit more about yourself? I was born French and I grew up in France. Before moving to Florida – a few years ago – I used to work for L’OREAL then for CHRISTIAN DIOR where I was in charge of accessories. As a marketing manager my job was to analyze the market, keep an eye on trends, and to determine which new lines of products we should create. I would also work in partnership with the designer, the sales force and the advertizing teams. This was a tough position (diplomacy was requirement # 1 to succeed) but it was also and above all a rewarding job in many regards. I am in my mid forties. In other words I am at the age where everything is possible. I don’t look back at my twenties or thirties with nostalgia. My two sons being now at college, I do have more free time to enjoy what I am doing and to work on new thrilling projects. Can you tell us a bit more about your blog and website Playing with Scarves? I confess a life time addiction for silk scarves. My friends like to call me “The Scarf Lady”. Many of these friends have suggested I should share my styling tips. That’s why I decided some months ago to share my tying and styling tips through scarf styling sessions, to start blogging, and to create “Playing with Scarves”- a scarf e-book available as a CD. In it, I show and explain 50 different styles I really like. But I am already thinking on a CD number two to demonstrate more styles… There are so many! Your style is very much associated with scarves? What attracts you so much to scarves? Scarves – and more especially silk scarves – belong to my everyday life. I wear one every single day, no matter what! It’s my personal signature. Among the many accessories a woman has to enhance her outfit, but also her face or her figure, scarves are, to my opinion, her best friends. They are absolutely magical. It’s amazing how such a little piece of fabric will add flair to any outfit and zest it up. Scarves are more than just an accessory. They provide us with the touch of color we need, they brighten up basic clothing. They can be mixed with other accessories (think about a chain intertwined with a scarf or a purse wrapped into a silk scarf). 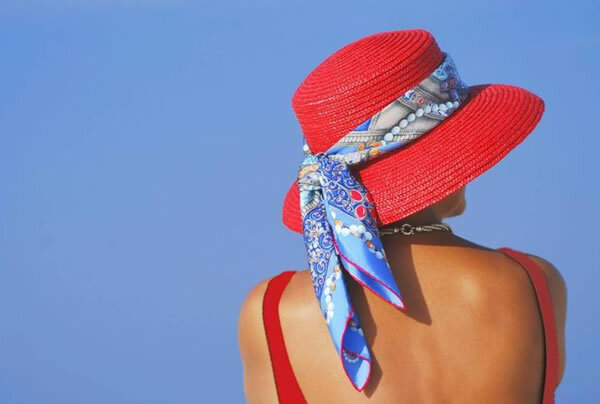 A bright scarf will be eye catching and will divert the eyes from parts of our body we are not comfortable with. In other words, scarves can do miracles! When did your fascination with scarves start and how has it evolved over the years? I owe my Mom my introduction to scarves. She is the one who offered me my first Hermès scarf the day I turned 18. Yet my deep fascination for scarves is probably older than that… Two memories remain vivid to my mind from the time I was a little kid. When my Mom would come and hug me at bed-time, I could smell her perfume (Femme de Rochas) and hear/ feel the soft rustle of her silk scarf. At that time, my fascination for scarves was probably unconscious. It was related to my Mom. In my twenties, I realized the power of seduction of scarves on men. Then my fascination for scarves changed when I entered the world of luxury brands. I became more sensitive to the creative aspect of designs and to the artwork there is behind a beautiful silk scarf deisgn. My fascination for scarves has increased with time and it is the result of all these multiple experiences I have been through. How would women that never use scarves as part of their style start incorporating them? As many women, as many personalities and styles… So each woman will start differently. I think there are two ways to look at a scarf. You can decide it will complement your outfit in an elegant way. In this case the scarf – usually chosen for its contrasting or matching color – acts like a subtle enhancing touch. It’s probably the easiest way to start incorporating a scarf. There is another way to look at scarves though. One can decide to make it the “star du jour”. In this case I recommend to first pick a scarf and then to work on the outfit which will go with it. For more advanced scarf lovers, it’s when you want to start playing original styles and original matches. It’s the right time to give free rein to your own imagination. How do you go about choosing your clothes? Do you perhaps start with a scarf or pick a scarf later on that suits your outfit? First of all, I would never go out without a scarf on….When I feel lazy (it happens! ), I pick a scarf I like and add it to complement my outfit as I would do with any other accessory. But most of the time, before getting dressed I like to decide which scarf I want to wear and how I will tie it – which means I will select my dress or top, but also my purse or even my shoes accordingly. My choices are ruled by my mood, by the weather and by the circumstances. The important point to me is to feel comfortable and in harmony both with the inner me and with the environment. Harmony is the keyword. Some days I feel like I can only wear a skirt or a dress. Other days, I feel like I won’t survive without pants. Hard to tell why… But it’s really the way I feel. Though I remain and will always remain sensitive to fashion and trends, my choices are never imposed by others’ rules. Of course there are things I would wear at the age of 20 (like miniskirts) that I don’t wear anymore!!! Other than that, I would say my style has not evolved in a drastic way after turning 40. The major changes come probably more from the fact I am now living in Florida. I have had to give up Parisian classic suits or winter coats – which I miss sometimes. But on the long term I’d say my style has remained the same: quiet colors, fluid lines, soft fabrics still have my preference. As far as scarves are concerned, my style has evolved over the years. I first started to wear scarves in a pretty conventional way like most Parisian women do. I would call that the first step to taming scarves. But, the more you get familiar with scarves, the more you want to create and invent new ways to tie and to wear them. I feel more creative with my scarves today than I ever was some years ago. I am not a big fan of dress rules and dress codes especially if age is supposed to be the criteria. Also our world has changed so much. I am not sure being dressed “age appropriately” means something anymore. Look at Jane Fonda… She is 74. She doesn’t deny her age. She doesn’t dress like a baby doll. She also doesn’t dress like old ladies would have dressed some years ago. My mother in law recently turned 79 and she still looks fantastic in a Lacoste dress or in a Ralph Lauren pair of pants. Of course, as I said earlier, there are a few things which might look weird as we are getting more mature. I am not sure a young girl outfit is appropriate on a lady who is forty. Other than that, I truly believe many things are possible today, whatever our age is. It’s more about finding the right personal balance. Of course, I remain interested in fashion and style. I still keep an eye on trends and I am always fascinated by the creativity of fashion designers. Yet I have learned to be more selective… I won’t dress in oxblood red today simply because everyone says it’s a must-have color… I just may decide to have a touch of this or that or to find my own inspiration from the current trend. About the way I look? Yes, I do care. It’s definitely a sign of respect to the ones you love and to yourself to put a little effort in the way you are dressed. Like anyone else there are days I don’t feel like dressing up (we all have the right to relax, right?)…. But on a daily basis this can be an easy and dangerous option. At my funeral, I’d like my beloved to remember me as an elegant woman, in all the senses of the word! We don’t live alone in a cave. We live in a society. We have a family. We have friends. We talk to others. I am careful about the way I look because it’s a sign of respect to others. It also has very much to do about feeling self confident! Which outfit from your site or book is your favorite outfit and why? The theme I call J’adore is one of my favs. I am using a scarf as a halter top which I pair with a black skirt – or sometimes with black pants. This style is simple to create and it is delightfully feminine (as you can tell, I am obsessed by femininity…). Because this is a women’s talk, I will add that it’s a very comfortable style. No bra is necessary if you tie your scarf tight enough. And no one will know it as the fluffy silk covers the breast in a nice way. Two things I have noticed in the recent fashion shows: the huge come back of scarves (see Dolce Gabbana, Marc Jacobs, Gucci and of course Hermès’ amazing ready-to-wear collection) and the big return to more feminine lines. Each model of Dior’s new collection is to die for… a true celebration of women! I am back to what I said previously: be yourself, feel confident and make sure you enhance your assets. Accept the fact that your body may change (but make sure you work on it!). Think about how lucky we are: today there is not one single trend but many trends. Fashion is diversity. Therefore there is something for each of us. Just pick the best out of it and choose what works for you. If you have nice legs and no tummy tuck issues, wear pencil skirts. If you have a thin waist, highlight it with a nice belt. If your cleavage is perfect make sure you were a top which enhances it. Rather than hiding what you don’t like, make people’s eyes focus on your assets. These are my main recommendations! The blogging world is amazing. It’s a vast and friendly community through which you can share and learn a lot. So I will keep blogging for sure. In addition to blogging and doing my scarf styling presentations, I am working on other exciting projects. One which is very dear to my heart is to develop a line of silk scarves I will select carefully for their quality and their original design. I am working hard on this project with a team of designers and I hope to be ready by the beginning of 2013. I want to thank you dearly and warmly, dear Sylvia, for this opportunity you gave me to speak about my passion for scarves and to express my opinion about fashion. You and I met through blogging and I really love the input you bring to so many of us: not only are you inspirational with all the tips you share about fashion. You also have a true and special talent to make women connect and become friends. Thank you and Bravo for everything you are doing in the blogosphere! Note from Sylvia: Thanks so much Anne for your insightful answers. 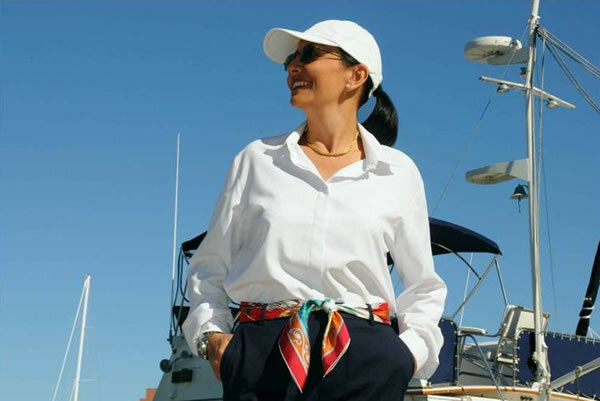 Be sure to check out Anne’s blog and if you want to learn how to wear scarves like Anne and see more than 50 variations, you can also consider buying her CD. I will post my review of her CD shortly and there may just be another dressing challenge coming up that involves scarves as well…. Be sure to subscribe through RSS, email or Bloglovin so you don’t miss it! Great interview. If there is one thing French women know, it’s how to wear a scarf! I truly believe that any woman can wear a scarf with style. French women are certainly not the only ones. A few tips and ideas you need to know and you are all good! Sylvia knows exactly how to run an interview. It was fun! As I said Sylvia has a real talent for fashion and for interviews. Thank you again dear Sylvia for the opportunity you gave me to speak about scarves and about the scarf CD. It was a real pleasure answering all your questions and sharing with you and with your readers my passion. 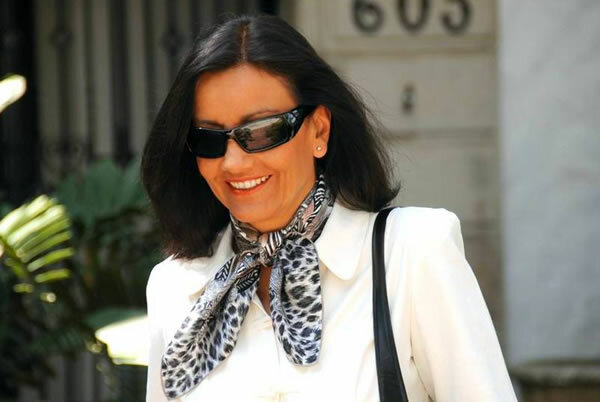 Thank you Anne for your inspirational answers and as you know we will be talking about scarves a bit more on this site shortly…..
Well, Anne likes dressing casual chic, but she is also a classic beauty. What a pretty woman! I would not be content with wearing a scarf every day, but I do like and use them. My problem is still how to tie them. They sit so perfect with Anne. How does she do that? Especially with silk, which is slippery. Great interview and I loved reading about Anne’s passion for scarves (my second favorite accessory). The gorgeous photos portray the magic and elegance of artistic expression. My second favorite passion is… hats. You and I should switch our blogs sometimes! Thank you for your kind words. A friend of mine who is a professional photographer helped me to make my dream – to share scarf styles and tips with other women – come true. Great interview, beautiful lady and so elegant. I wish I were French, and that says it all! Thanks Aileen 🙂 I was on your website. What a talent you have. Your watercolors are simply “maginifiques”. Bravo. Wishing you lots of success. Thank you Anne, that’s a lovely compliment. i love scarves add color style but not make me fat. Next post: What kind of clothes do women over 40 want? The ultimate wish list!